I'm working on a quilt that has curved edges and rounded corners and wanted to share with you my techniques to have a perfect binding. Some of these tips I use for all of my bindings. Tip #1 - When you measure for the amount of binding that you'll need, use a dressmaker's tape measure and stand it up on end. 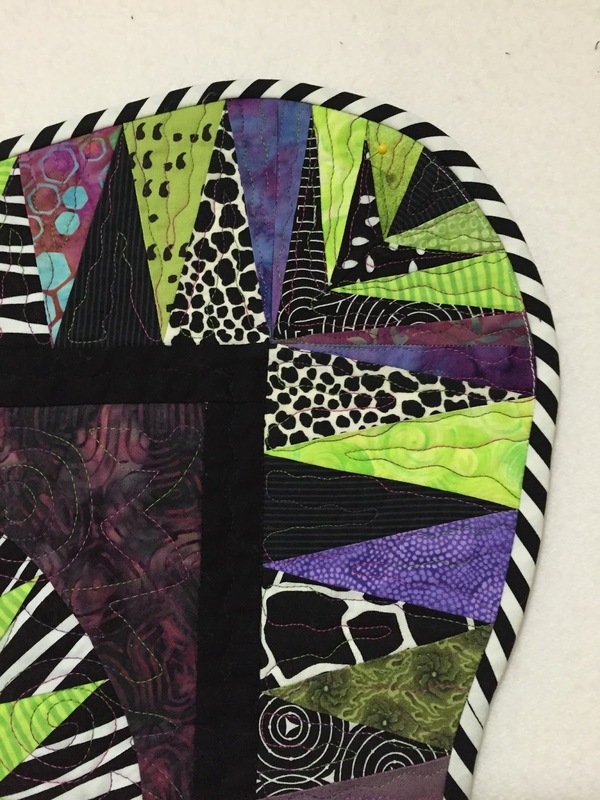 Place it along the edge of the quilt and measure all around the edges to get a total length, then add 10". You'll be surprised at how much more binding you'll need to go around all of those curvy edges. Tip #2 - Don't trim your quilt to the edge of the top before you sew on the binding. 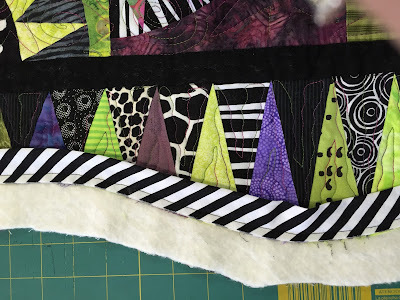 It is much easier to sew on the binding if you have something to hang onto and something for the feed dogs to grip as you sew. I usually trim "generously" first, leaving an extra 1/2" or more that will be trimmed off later. 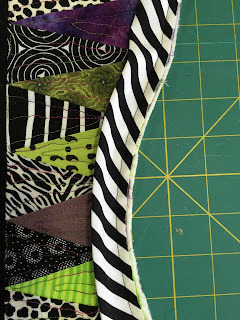 Tip #3 - When you use bias binding, be sure not to stretch it when you sew it to the quilt edges. When you go around outside curves, and especially at the rounded corners, "push" a little extra so that you get a bit of a ruffle effect. 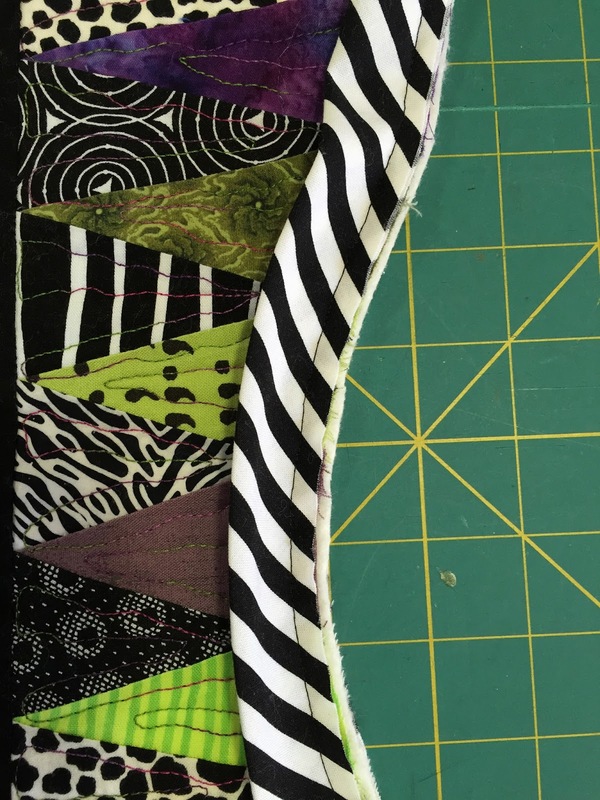 This extra is needed when you turn the binding to go around the extra distance at the outer edge of the quilt. Look at the picture above and below. 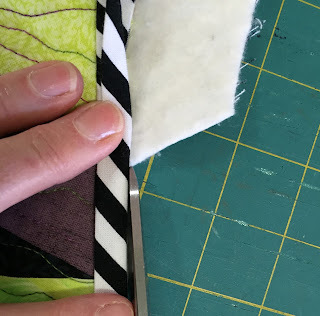 Tip #4- When you are ready to trim the batting and backing, fold over the binding TO THE FRONT SIDE, and carefully trim to the edge of the binding. This is to make sure that the binding is full at the edges. Most of the time, a little extra is needed beyond the edge of the quilt top. 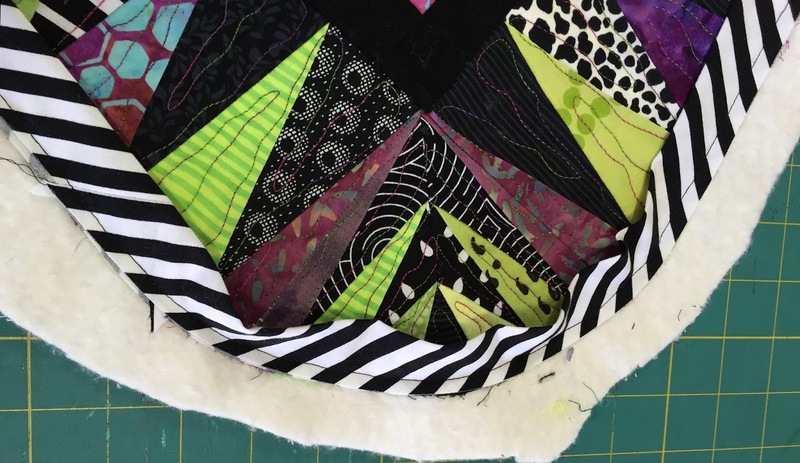 Judges check this feature, so if you're entering contests, make sure the batting completely fills the binding! 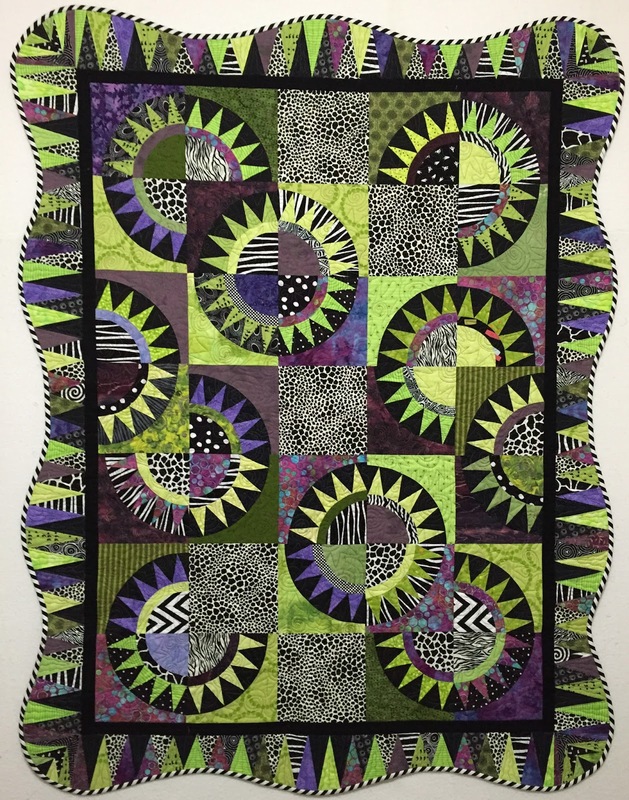 Look at the picture below to see that a tiny amount was needed beyond the quilt top to fill the binding. After you have trimmed the binding, you are ready to hand sew it down on the back as per normal. And here it is all sewn down. 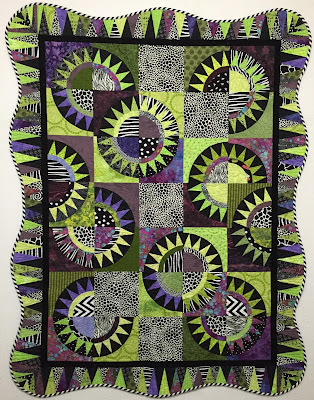 Hope you like the quilt. 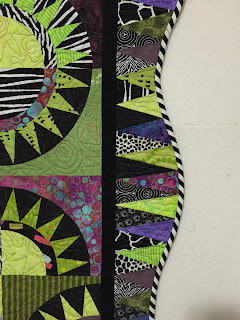 And I hope this helps you on your next curved edge quilt.